I have a strange visitor in my study tonight. Earlier Thalia fell asleep quickly as I read to her. We’d been out most of the day—in the cold—feeding the tower ravens. I’d carried her off to bed, returned to the study, and settled down with my pipe, before realizing her battered copy of Grimm’s still lay on my table. I was considering returning it to her bedroom when my visitor flew in, landing on the table. “There you are,” she said to the book. She now stands at the foot of the open volume, her translucent wings catching the moonlight coming through the bay window, her fine, wild black hair moving about, blown by a draft I can’t feel. She reads aloud to herself. She is reading The Glass Coffin. In this tale, a poor tailor, lost in a forest, takes refuge in the hut of an old, cranky man. The next morning the tailor is awakened by a black bull and a stag battling outside. When the stag is victorious, it scoops the tailor up in its antlers and carries him off to a subterranean hall. A disembodied voice instructs him. The tailor does, and the stone sinks down to a deeper level. There the tailor sees stacked along the walls, glass vases filled with colored vapors, and two glass coffins. In one is a miniature kingdom with a castle, farmhouses, barns, and stables. In the other is a beautiful, sleeping girl who awakes as he watches her. The tailor does this easily. Freed, she tells him her story. She is the daughter of a rich count, raised by her brother after their parents’ death. Devoted to each other, they decide neither should marry. One day they give shelter to a traveler. To their misfortune, he is a magician, who falls in love with her and tries to seduce her through his art. She repulses him and he takes his revenge by turning her brother into a stag, her people and servants into vapor, the kingdom into a miniature, putting it and her into glass coffins. She bids the tailor help her move the glass coffin containing the kingdom onto the stone, which carries them to the upper world. When the coffin is opened, the kingdom grows into its proper size. From the glass vases, they release the vapors that turn back into the living. The brother, who in the form of the stag killed the magician in the form of the black bull, returns to his human shape. As reward, the tailor marries the girl. She struggles to close the heavy cover and pages until it makes the “plunk” that only a book can make, then flitters off without a glance at me. I am taken aback by my conceit. I assumed fairy tales were created for the likes of me. I had noticed there are precious few fairies in fairy tales, and now see that the tales were never about fairies. These books should be printed in a much smaller form for their true, intended audience. I enter Augustus’ tobacco shop to the familiar ring of the bell above the door and the heavy odors in the air. As Augustus weighs out a few ounces, I pose my question. Augustus pauses, weighing out my order on his scale. “The Twelve Brothers and The Three Snake Leaves come to mind. If memory serves, in The Twelve Brothers the king has twelve sons. His queen is pregnant and he declares—inexplicably—that if she has a girl he will prefer her and put his sons to death. “He goes so far as to have twelve coffins made. The queen, to save her children, shows the coffins to her youngest son. They devise a plan to counter the king’s intent. A daughter is born, but her brothers are able to escape. Augustus weighs out the Fairies’ Delight. “In the case of The Three Snake Leaves our protagonist accompanies his wife’s coffin into the sepulcher, to die beside her. “A snake crawls into the chamber, which he kills with three strikes of his sword. Another snake appears with three green leaves to put upon the wounds. The dead snake returns to life and the two serpents slither off. I watch him pour the Fairies’ Delight into a plastic bag. Augustus flashes a smile. “When coffins appear in a story as a significant element, they signify the defiance of death. “The twelve brothers escape their deaths, and the coffins remain empty. “The snake leaves are used to bring the occupant of the coffin back from the dead. “In the case of Snow White, she is not really dead, but under a spell, which the stumbling servants of the prince inadvertently break, jolting the bite of poison apple from her throat. “Quite.” He hands me my tobacco. The tailor’s progress through the events of the story struck me as a series of conveniences. Perhaps being scooped up in the stag’s antlers and carried about can be seen as harrowing, but he came to no harm. After the wild ride he simply followed instructions that promised rewards. For what good deed does he get to marry the rich and beautiful girl? He pulled back the bolt on the glass coffin. Not exactly derring-do. 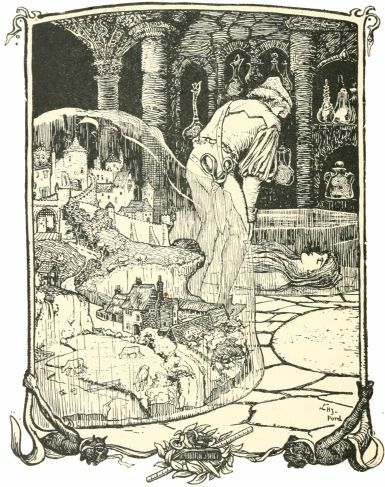 The Grimms culled this one from a romance, laboriously titled Polidor’s Strange and Most Amusing Life at School and the University, by Sylvano, and not through their usual contacts with acquaintances, friends, and family. 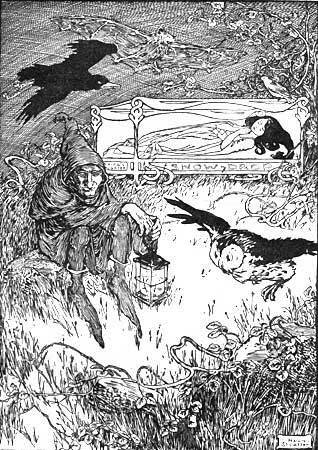 Nonetheless, the Grimms heard enough authentic folk voice in the story to include it in their collection. One of the wishful thoughts of the long-ago listener, which this story satisfies, is the act of a peasant rising above his class. This is a disturbingly popular theme, given the reality that peasants rising above the station to which they were born was pretty hopeless right into the mid-nineteenth century. The Grimms were keenly aware of the rising middle class in Germany, which embodied the spirit of German nationalism. The Grimms’ books were published in the context of Germans being ruled over by the Holy Roman Empire. During the Grimms’ lifetime, Germany, as a country, had not come into existence. That did not happen until 1871 with the formation of the German Empire, eight years after Jacob Grimm’s death, Wilhelm having died earlier. I am going to get out of hand. I intend to make wild and unsubstantiated statements, and blame it on my “Arial” attitude and the Fairies’ Delight I am smoking. 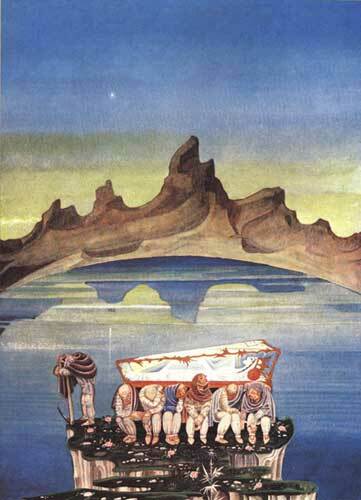 The Glass Coffin appealed to the Grimms because they saw it as emblematic of their own people’s struggle and hope. In this story the brother, transformed from his true nature into a stag, represents the suppressed German people. The black bull would then be representing the aristocracy, members of the Holy Roman Empire’s upper class, who ruled over the better part of Europe with a heavy hand. In the struggle witnessed by the tailor, the stag defeats the black bull, symbolizing the Germans’ triumph over their oppressors. The sister of the stag represents the Germanic spirit that the aristocracy would contain. Germany is the miniature kingdom that is released from its coffin to expand to its proper size. The people in the vases are the folk, who are released from their vaporous state. Our tailor represents the middle class, who, in the Grimms’ view, deserve what good fortune comes their way. The marriage is between them and the Germanic spirit. What could be more clear, except for my suspicion that I am dead wrong and the Grimms’ never thought anything of the sort. But conjecture is so much fun! I could be right. I now believe in fairies; should I not believe in my own winged notions?